NOW with Vitamin K2 in the form of MK-7! Vitamin K2 is an important accompaniment to Vitamin D, without which Vitamin D cannot work properly. Any high potency Vitamin D formula without K2 can create deficiencies. Research shows that 97% of the population is deficient in this vitamin. Different from Vitamin K known as K1, Vitamin K2 works to keep blood vessels free of calcium build up and ensures calcium is used in the bones. This is why Vitamin K2 is being tauted as the most important “unknown” nutrient in the world. K2 has been shown to increase life spans up to 7 years in many studies. The form of K2 is critical. Only the MK-7 form lasts a long time in the bloodstream and is the only form derived from food. Optimal Longevi-D-K2 has 60 mcg of Vitamin K2 (menaquinone-7) per capsule! Vitamin D is being called the Nutrient of the Decade by many scientists and researchers. The reason is because this once overlooked vitamin has been proven in hundreds of studies over the last few years to be essential for your health. It is so powerful that it transcends the definition of a mere vitamin: It is actually a prohormone, and essential in most organs, including the brain, heart, skin, gonads, prostate gland, and mammary glands. Vitamin D receptors are also involved in immune regulation and mediate response to infection and inflammatory processes. The vitamin that was taught to be sufficiently gained by sunlight exposure 20 minutes a day is now becoming deficient in spite of the sunlight. Typical blood levels of Vitamin D have dropped over the past decade to the point that, according to a recent study, 77% of Americans have insufficient amounts (even in sunny places like Arizona). Obesity is one of the reasons for this increase because fat holds onto Vitamin D, making it less available to the rest of the body. Another major research study compared national deficiency studies (NHAMES) and found that there was a marked decline across the board. They suggested that the majority of children and adults in the United States (and almost all African and Mexican-Americans) are vitamin D insufficient. Cardiovascular Disease- Vitamin D deficiency is associated with increased risk for cardiovascular events and mortality in a multi-ethnic study of atherosclerosis. Obesity is a major risk factor for cardiovascular disease. Studies confirm an association between obesity and Vitamin D deficiency, and low Vitamin D status is predictive of insulin resistance. Overweight women replete with Vitamin D shed pounds more successfully. Cancer Scientists have been able to establish the biological impact of Vitamin D in cancer prevention, recognizing the vitamins effects on cell proliferation. Vitamin D has a putative involvement in both primary and secondary prevention of prostate cancer and breast cancer as well as non-Hodgkins lymphoma, melanoma, and other malignancies. One Finnish study found that subjects with the lowest levels of Vitamin D had a three-fold higher risk of developing pancreatic cancer. Mortality (Life Expectancy) - One of the most motivating reasons to take higher dosages of vitamin D comes from a study of 3,400 French men, age 50 years and older, correlating vitamin D status with all-causes of mortality. Men with the lowest vitamin D levels had a 44% higher death rate. Athletics- Athletic trainers, cognizant of research suggesting that vitamin D may augment muscle strength, are increasingly embracing oral supplementation and UV-light for purpose of performance enhancement. CAN I OVERDOSE ON VITAMIN D BECAUSE IT'S FAT SOLUBLE? Even mainstream researchers for major papers like the Washington Post understand the difference betweensynthetic and whole food vitamins. They stated that you can't get too much Vitamin D from sun or food. If you are taking a synthetic supplement vitamin D, you must realize the liver has to do the processing and it can put a strain on it. That is why other fat soluble synthetic vitamins like Vitamin A have limits placed on them for pregnancy and the elderly. Always stick with Whole Food Vitamins. WHAT FORM OF VITAMIN D SHOULD I TAKE? Supplemental Vitamin D has been found to be beneficial. A recent study showed that Vitamin D supplementation was associated with an increased life span of 7%. The subjects were healthy, middle aged or elderly people. They took around 1,000 to 2,000 IU/day. Vitamin D supplements were only available in two forms until now. D2 (ergocalciferol) and D3 (cholecalciferal). Vitamin D2 is manufactured by the UV irradiation of ergosterol in yeast. Vitamin D3 is manufactured by the irradiation of lanolin (sheep wool). Research has leaned toward the vitamin D3 form because of its ability to be absorbed as much as 3 times more. Health food stores generally carry Vitamin D3. The best form of Vitamin D supplementation would be to get it in its whole food form as it exists in nature. Now available is a Vitamin D supplement that has been cultured in a live yeast, probiotics, enzyme and whole food matrix. This creates all the components for the end result of a High Potency whole food Vitamin D supplement. What do your senses tell you? Taking a synthetic vitamin D supplement or a cultured whole food based one? Of course the whole food supplement makes more sense. Vitamin D has a tremendous impact on many of the bodyies physiological processes from allergic diseases, depression, schizophrenia, cognitive impairment, pre-eclampsia, fibromyalgia, Parkinson disease, polycystic ovary syndrome, and benign prostatic hyperplasia. This impact shows the ubiquitous nature of Vitamin D. Because Vitamin D is present throughout the cellular tissues of the body and it is fat soluble, it makes it a perfect companion with CoQ10 because CoQ10 is ubiquitous (present in every cell and tissue) and it is fat soluble. COQ10 was discovered in 1957 but its name was different. It was called Ubiquinone. The reason it was called this was because the nutrient was found to be ubiquitous which means present in every cell and tissue of the body. This is important to know because it helps us realize how important this nutrient is. Every single cell in the body uses this spark plug to ignite the cellular energy needed for each and every cell to do its job. Although CoQ10 is present in every cell and tissue, it is concentrated most in the heart because the heart requires a constant energy flow to keep it beating and keep us alive. It is very important to understand that the body doesn't use CoQ10 as Ubiquinone, although that is the main form of CoQ10 sold to consumers. The body actually breaks down or reduces the Ubiquinone down to Ubiquinol and then it is utilized by the cells of the body. If the body is already under stress, it is hard to do this. The body uses a complex process to reduce Ubiquinone to Ubiquinol that demands vitamin B6, B12, Folic Acid, Niacinimide, Panothenic Acid and Vitamin C. It also uses Amino Acids if they are available. If they are not available in the blood stream they will be taken from the muscles. The body utilizes and stores the Ubiquinol form of CoQ10. We've known for some time that the research shows the higher the CoQ10 levels (Ubiquinol) are in the body, the healthier we are. The problem has been that supplementing CoQ10 as Ubiquinone is not in the OHS philosophy because there are concerns about the energy used to convert it to useable CoQ10. That problem has finally been solved. CoQ10 is a fat soluble substance and therefore it is absorbed with fats in our diet like Vitamin D. The other places that CoQ10 is concentrated in the body are the other areas that have a high metabolic activity rate. This includes not only the heart but also muscles, liver, kidney and brain. CoQ10s main job (primary function) is to produce cellular energy to keep our bodies efficient, healthy and immune from disease. Because of this, CoQ10 is also a very powerful antioxidant. CoQ10 has been called a conditionally essential nutrient until now because the body can synthesize it from certain nutrients. Because of our abuse of processed foods that deplete our enzyme levels and our Western diet and lifestyle choices, CoQ10 levels have been shown to be depleted as we age, starting from your 20s. That depletion has opened us up to many disease conditions. Clinical conditions and health benefits associated with CoQ10 that is documented by research: There is a large body of data on the beneficial effects of CoQ10 supplementation. Cardiovascular Disease CoQ10 protects LDL fats from oxidizing which helps prevent heart disease. CoQ10 has also shown to be low in the majority of heart failures. The bottom line with heart disease conditions is that higher amounts of CoQ10 in the system keep the heart strong and healthy. Neurodegenerative Disease These diseases include Huntingtons, Parkinsons, Alzheimers and Lou Gehrigs Disease. High dosage supplementation of CoQ10 in these conditions has been very promising as of late. Neuromuscular Diseases such as Muscular dystrophy, diabetes, cancer, asthma, migraines, immune disorders, HIV/AIDS, Periodontal disease, chronic fatigue syndrome and male infertility have all documented research showing that CoQ10 levels play a role in their development. CoQ10 supplementation studies are very promising with all of these disorders. It is important to supplement this nutrient because the production of CoQ10 declines with age. It is found in organ meats but the typical western diet only supplies about 5mg of CoQ10 daily. Remember that the body then has to reduce that form into the useable Ubiquinol form for the cells to utilize and make energy from. WHY HAS OHS WAITED UNTIL NOW TO BRING A COQ10 PRODUCT TO MARKET? Until a few years ago, the only form of CoQ10 supplement on the market was the Ubiquinone form. Also, the studies have just been completed showing the marked decline of CoQ10 in adults after the age of 20, even if they live an active healthy lifestyle. The reduced form of CoQ10 is finally available on the market and that caused the OHS team to get excited. The research is very clear that CoQ10 in the Ubiquinol reduced form is absorbed better and up to eight times more effective than the Ubiquinone form. OHS has taken this knowledge and improved it even further by taking the powerful CoQ10 Ubiquinol and putting it in an Organic based cultured media that contains Whole Foods, probiotics, plant enzymes, organic yeast and pea. This Cultured Media binds with the Ubiquinol to create and even greater delivery. Research has shown that CoQ10 products are absorbed better when taken with food. By putting the reduced form of CoQ10 in a live food culture, the results are amazing. WHAT IS THE RECOMMENDED AMOUNT? Because CoQ10 is absorbed and utilized eight times better than the widely sold Ubiquinone form, you will only need 15mg to get the benefits of 120mg of the Ubiqinone form. It is recommended to take 60mg CoQ10 (Ubiquinol form) a day as a loading phase for two weeks in normal, healthy adults and then 30mg a day as a maintenance phase. This would be 4 capsules a day for two weeks and then 2 capsules a day thereafter. ARE HIGHER AMOUNTS USED AND PROVEN TO BE SAFE IN CLINICAL CONDITIONS? YES. The safety of high doses over long periods is very well documented in the literature. The only side effects reported with small number of subjects are mild gastrointestinal symptoms such as nausea and stomach upset when very high dosages were used. In a recent study, doses as high as 3000mg a day (Ubiquinone) which would be equivalent to 375mg of OHS's Ubiquinol, were found to be safe and tolerable in patients with Parkinsons Disease. In a recent trial on the safety of CoQ10 in its reduced form as ubiquinol in human subjects showed dosages of 300mg daily for months was found to be safe and effective. Higher dosages over 300mg of Ubiquinol daily were not tested in that study. Although these dosages are safe, the research shows that they are not needed. 60mg of Ubiquinol (4 capsules) is equivalent to 480mg of Ubiquinone and that is considered a high potency dosage. WHY COMBINE WHOLE FOOD VITAMIN D AND COQ10 TOGETHER? As you can see, Vitamin D along with CoQ10 is becoming depleted in the majority of the population as we age past 20. Both of these nutrients are found in almost every tissue and cell in the body (Ubiquitous). Both nutrients play a profound role in cardiovascular health, muscle strength and viability (including the heart). And both are extremely beneficial for overall longevity and high quality of life. Instead of taking a synthetic form of Vitamin D or CoQ10 in the Ubiquinone form like most people do, you now have the ability to supplement whole food nutrients put together in the most absorbable and utilizable way just as nature intended. 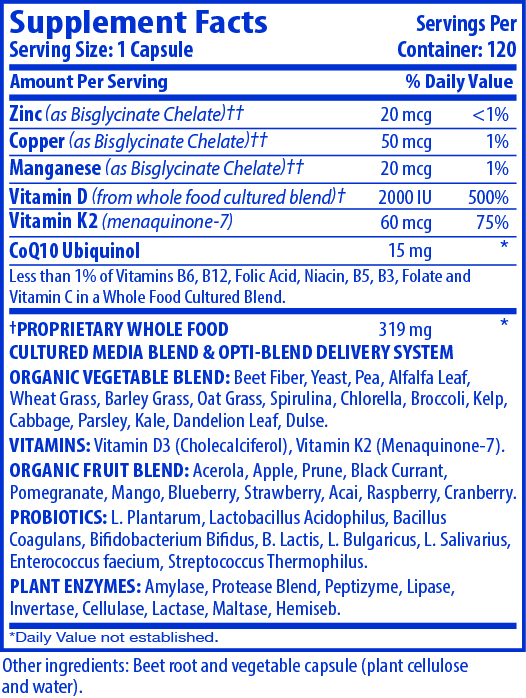 *Organic Vegetable Blend: Yeast, Pea, Alfalfa Leaf, Wheat Grass, Barley Grass, Oat Grass, Spirulina, Chlorella, Broccoli, Kelp, Cabbage, Parsley, Kale, Dandelion Leaf, Dulse. Organic Fruit Blend: Acerola, Apple, Prune, Black Currant, Pomegranate, Mango, Blueberry, Strawberry, Acai, Rasberry, Cranberry. Probiotics: L.Plantarum, Lactobacillus Acidophilus, Bacillus Coagulans, Bifidobacterium Bifidus, B. Lactis, L. Bulgaricus, L. Salivarius, Entercoccus Faecium, Streptococcus Thermophilus.